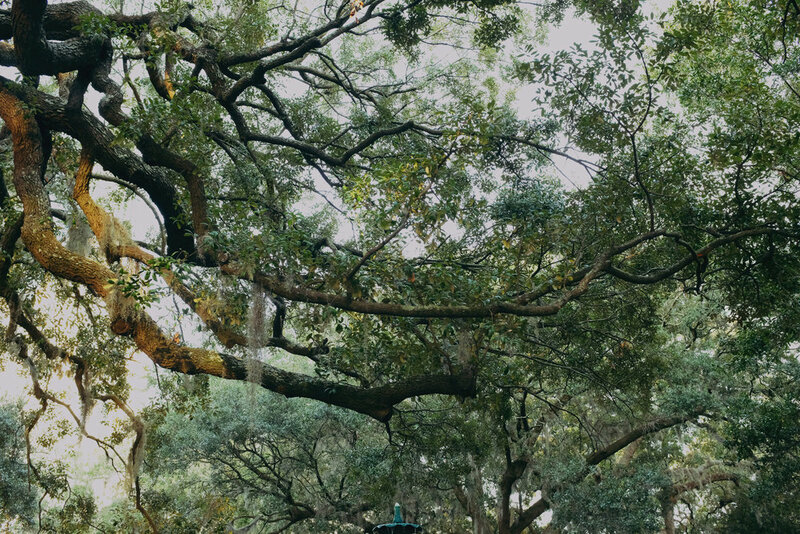 When Conor and I announced we were going to Charleston and Savannah for our honeymoon, I got tons of amazing recommendations from friends and coworkers...for Charleston. My google spreadsheet tab was soon teaming with incredible restaurant lists, hotel tips and activities, and I bookmarked about a gazillion supplementary city guides. But Savannah? That tab remained a sad landscape of barren boxes and even my diligent internet sleuthing turned up nothing. It seemed like everything was written for old people (I'm so mean, but it's true!) We ended up booking a stodgy B&B, making one advance restaurant reservation, and deciding to wing the rest. 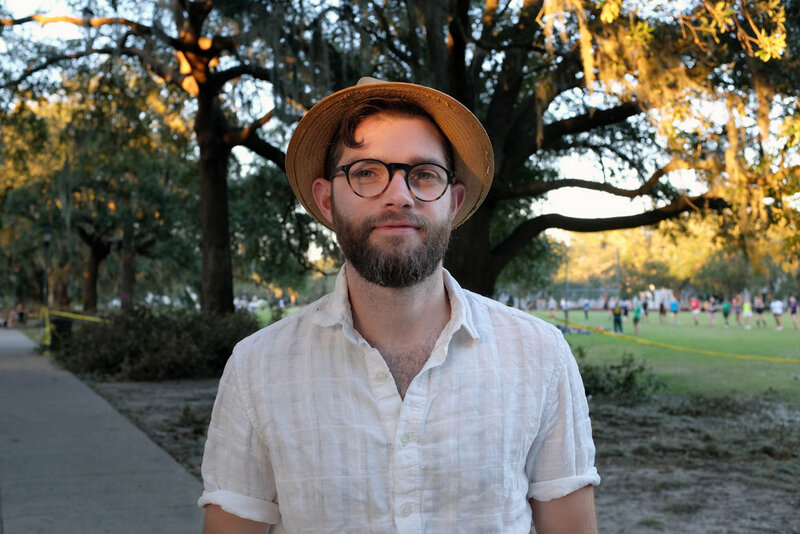 I should mention that Conor graduated from Savannah College of Art and Design (SCAD) seven years ago and is familiar with city. We landed in Charleston first and it was a total dream. I understood why people's eyes had lit up when I told them about our honeymoon plans. It's just so damn pretty. The colorful homes, the palm trees, the bright light, the history, the food. It's an easy city to love. A few days later, we drove to Savannah and I found myself initially unimpressed. It was darker than Charleston, the beauty was less blatant and I missed my pastel Instagram backdrops. 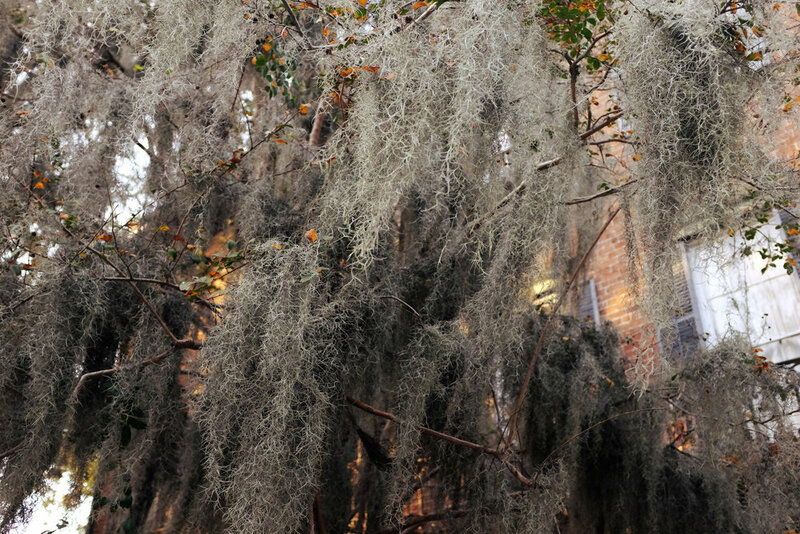 But, as we walked around the historic squares I started to feel the city's magic - the moody setting sun, the sweeping Spanish Moss. 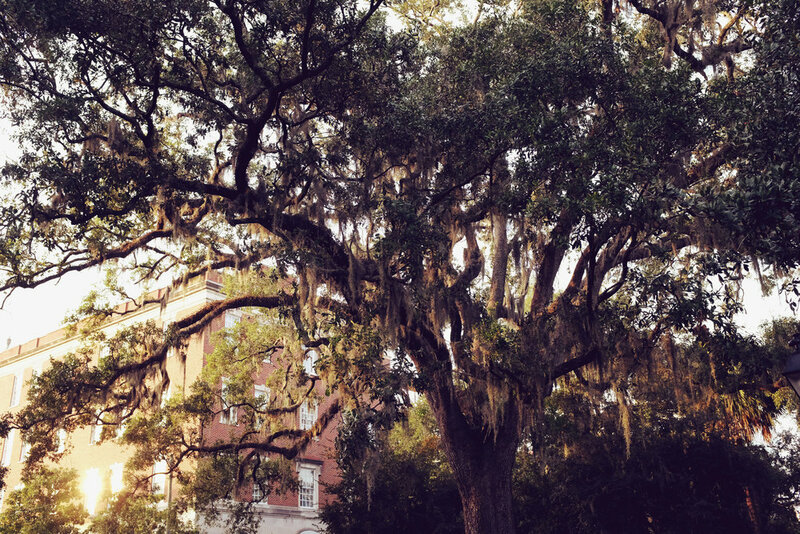 Savannah's beauty creeps up on you slowly and then all at once. Below are my best recommendations though I never did find that perfect place to book. If anyone out there has the capital to buy a historic building and transform it into a cool B&B - do it, there is serious opportunity and I would like to come and stay there. The Mansion on Forsyth Park - perfectly located on stunning Forsyth park, with huge rooms. Lucky Savannah - a bigger and better selection of apartments for short term rentals than AirBnB. Mrs. Wilkes - If you go anywhere, go here. Mrs. Wilkes is only open Monday to Friday, between 11 and 2 PM. There is always a line, so get there early - we arrived at 10 am and it was well worth it. Once the doors open, you'll be escorted to a communal dining table with the most insane selection of southern food you will ever see, all for a fixed price of $22. The Collins Quarter - A trendy Australian restaurant in the heart of the historic district with a delicious burger and a popular brunch menu. The Grey - Located in a refurbished Greyhound bus station, this modern southern restaurant has a bit of Brooklyn flair. Make a reservation in advance and arrive early to grab a drink at the bar. Zunzis - This super casual lunch spot serves a juicy roast chicken sandwich called The Conquistador, also known as one of the best sandwiches in America! It goes perfectly with Voo Doo chips and sweet tea. Gryphon Tea Room - this SCAD-owned cafe was unfortunately closed while we were there due to Hurricane Mathew (a trend you will see throughout this guide.) However, I did my fair share of creepy window peering and it looked pretty charming. Planters Tavern at the Olde Pink House - This covert bar is located in the cellar of a very pink colonial mansion. Be sure to arrive before 6:30 to grab a good spot for the live piano performance starting at 7:30. We had the most incredible 85 year-old woman rocking a fully shear top dedicate La Vie En Rose to us. Pure magic. Perch Bar - Located on the corner of Forsyth Park, you can literally site among the wild oaks as you sip tasty cocktails. Artillery Bar - A modern, elegant spot with fancy drinks. At midnight, the bar filled up with couples in tuxedos and ball gowns who were definitely on their way back from a classy society gathering. Savannah Bee Company: This popular chain of honey-based products has a flagship store on Broughton street where you can do a Mead tasting (also known as honey-wine.) The Whipped Honey with Cinnamon is worth picking up as well. Pralines: Savannah is known for their pralines - pecans covered in caramelized sugar. Pick up some fresh ones at Savannah Candy Kitchen or River Street Sweets. Hop On Hop Off Trolley Tours: I normally find trolly tours cheesy, but it was nice to learn about different parts of the city from bus drivers with syrupy southern drawls. It was also a good way to discover landmarks to visit in person later such as the First African Baptist Church and The Mercer Williams House. Tybee Island: A quick 30 minute Uber drive from the city center - this barrier island is home to wide stretches of beautiful sandy beaches. Visit North Beach for fewer crowds and be sure to check out some of the near-by coastal walks. Bonaventure Cemetery: Unfortunately, this was closed due to Hurricane Matthew while we were there. It is known as one of the world's most beautiful cemeteries and has towering wild oaks. The Savannah National Wildlife Refuge: Also closed due to Hurricane Matthew. It was too bad because I really wanted to hang out with the alligators. Finally, just walk around the majestic squares and Forsyth park with a to-go cup. Seriously, you can drink on the street IN PUBLIC. I loved being able to venture into a bar and ask for my wine to-go. Does it get any more "i'm on holiday" than that? Older PostItaly, Together, With Friends.